How are Formula One's elite faring in the battle for supremacy? 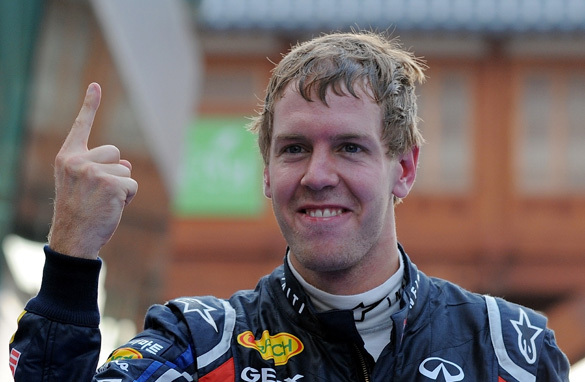 Sebastian Vettel with his familiar No.1 pose from his all-conquering 2011 season. Why hasn't Red Bull won a race so far this year? What's happened to Sebastian Vettel and Mark Webber? Last year the German driver turned up at every track expecting to win, such was the dominance of his car. However, this year it's all changed. Mercedes has won its first race since 1955, McLaren has started the year with a quick car, and Ferrari most certainly hasn't. Is Red Bull's dominance finally over? It is for now, but don't expect double world champion Vettel to be happy not taking that checkered flag and showing us all that "victory finger" of his. McLaren: McLaren has spent the last few years playing catch up throughout the season having started the year with an uncompetitive car. However, this year it has started well, and Jenson Button's victory in the Australian Grand Prix is proof that the team has stolen a march on its rivals. The Britain-based outfit is also one of the best in the pit lane at mid-season development. It has the resources, and the drivers in Lewis Hamilton and Button, to be an almost certain championship contender. It's also one of only two teams to maintain its car's elegance by avoiding the stepped-nose design. Mercedes: Since the takeover of Brawn GP at the end of 2009, Mercedes has struggled to replicate the form that carried Jenson Button to that year's title. Brawn GP dramatically downsized its team during that championship year and it's only now, over two years later, that Mercedes has managed to recover that form. Rosberg's win and pole position in China were sublime and now that he has that maiden win under his belt - after 111 races - expect him to keep posting strong results. Their straight-line speed from the last two years now seems to have been carried into the corners. Mercedes are in a very strong position to take their first world championship since 1955. Red Bull: Red Bull, particularly in qualifying, was untouchable last year and carried Sebastian Vettel to his second World Championship. However, this year it has struggled in qualifying which many people are putting down to the ban on off-throttle blown diffusers. Last year Red Bull perfected the technology that meant, even when the driver wasn't on the throttle, exhaust gases were blown over the rear of the car creating a huge amount of downforce and therefore grip. Don't write the team off though. It has huge resources and two very quick drivers. Expect them to be back at the front soon. Ferrari: It all seems to have gone wrong for Ferrari this year. The car is nowhere near as quick as the front-runners, but Fernando Alonso did manage to pull of a stunning victory in a mixed conditions Malaysian Grand Prix. Don't be fooled though. The Ferrari's dry pace is nowhere near the likes of McLaren. Felipe Massa - whose seat in the team is under pressure - is still struggling to match Alonso's pace. The lack of form is being put down to his huge accident in the second part of qualifying for the 2009 Hungarian Grand Prix, when a spring from Rubens Barrichello's Brawn GP car hit him in the head. However, he was quick when he returned at the beginning of 2010 and his current lack of form seems to stem from being asked to move over for his team-mate Alonso in that year's German Grand Prix at Hockenheim. If ever there was a message to say "you are the number two driver," that was it. Ferrari may struggle to catch up with the might of Red Bull, McLaren and Mercedes. Renault and Sauber: Kimi Raikkonen, after a two-year sabbatical in the World Rally Championship, seems to have lost none of his pace. Meanwhile, Sauber's Sergio Perez has managed to prove that he is a worthy possible successor to Massa at Ferrari after a brilliant drive in the Chinese Grand Prix, which brought him his first podium in F1. But the burning question is whether these midfield teams can keep up with the speed of development that the top outfits can manage. Will this be one of the most exciting championships of recent years? It'll be hard to beat the heart-stopping final race in 2008, when Lewis Hamilton won the title on the last corner of the last lap, but on current evidence things are looking good. Look at the amount of overtaking in the past few races. I know, overtaking in F1? We're certainly entering a golden era of racing. they must make a new f1 with over 650hp like the old one,and it must be center drive.hopefully they go twin turbo v10 iansetd of a v12.but naturally aspirated 12 will make more than enough power and torque. Watch the Circuit on CNN International's World Sport show on the Friday before each grand prix at 1700 GMT.